Photo of the day: FROSTED BLOOMS – Yesterday morning many of us in the Central and North Eastern part of the United States woke up to a rather rude awakening – that four letter word SNOW! 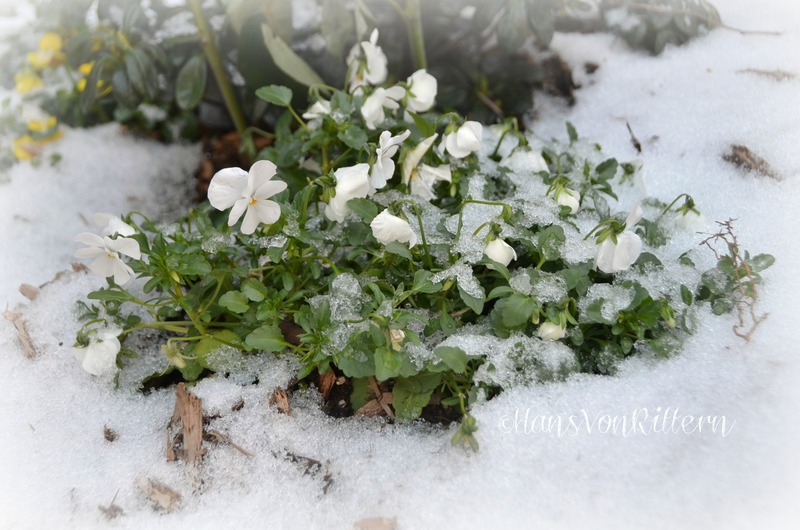 After having been teased with near 80F degree weather here in Manhattan and sporting flip flops, this morning the roads were iced, cars were encased in an icy snow and the spring plants had been covered with a last minute frosting. But, warmth is coming, the Farmer’s Almanac predicted today that the summer of 2014 will (again) be unusually hot and filled with (more) torrential rains – at least it’s not snow! This entry was posted on April 17, 2014 by newyorkcityinthewitofaneye. It was filed under DAILY PHOTOS WITH STORIES OF NEW YORK CITY and was tagged with April snowfall, changeable weather, Farmer's Almanac, flowers covered with snow, frozen pansies, Hans Von Rittern, late spring snowfall, Manhattan, New York City, New York photo, Photo of the day, photography, white pansies covered in snow.